In its purest sense, Atheism is merely a lack of belief in god or gods (from the Greek, “a”, without: and “theo”, god”). In reality, there are varying degrees of atheism. Technically, agnosticism is a position of knowledge, rather than a belief. As such, many atheists are also agnostic, or "agnostic atheist". Agnostic atheism is the view of those who do not believe in the existence of any deity and accept that such knowledge is inherently unknowable. Richard Dawkins suggests that what is knowable should be based on probability. Although there is no evidence to suggest a god exists, we can't disprove it with absolute certainty. As Dawkins would point out with some humor, I am agnostic to the extent that I am agnostic about fairies at the bottom of the garden." Can atheists say that god does not exist with certainty? Atheists do not say there is no god - atheists simply lack belief in god. There are varying degrees of atheists. At minimum, atheists hold that a convincing case for the existence of god has not been made by anyone. Some atheists do not claim to disprove god with absolute certainty, but contend that a supernatural creator almost certainly does not exist. Other atheists go further and affirmatively say that a good case can be made that god does not exist and is simply a human invention. 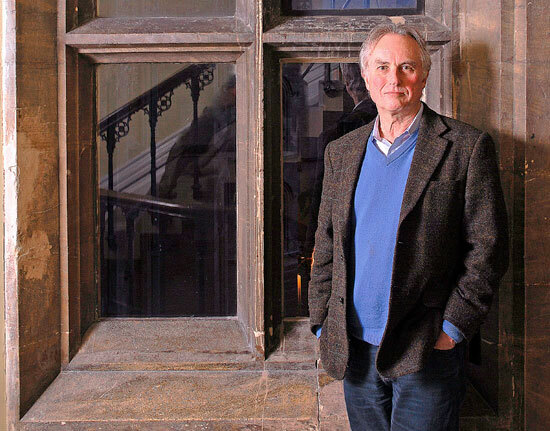 According to Wikipedia, Dawkins argues that while there appear to be plenty of individuals that would place themselves as "1" due to the strictness of religious doctrine against doubt, most atheists do not consider themselves "7" because atheism arises from a lack of evidence and evidence can always change a thinking person's mind. In print, Dawkins self-identified as a '6', though when interviewed by Bill Maher and later by Anthony Kenny, he suggested '6.9' to be more accurate. What do atheists trust to be true? What atheists generally hold in common is a deep commitment to using reason, logic and verifiable evidence to come to conclusions about the truth of our existence and the nature of our universe. Many atheists share a trust in the scientific method (the process by which scientist, collectively and over time, endeavor to construct an accurate representation of the world to inform these conclusions through observation, hypothesis, prediction and verification through experimentation). Is it arrogant to say god does not exist? Quite the opposite. There is a humility and intellectual honesty in seeking out and accepting how the universe really works regardless of how satisfying or reassuring it is to us individually. Atheists recognize that we don’t understand everything - and that is okay! The good news is that we live in a unique time in human history where through an accumulation of scientific knowledge and technology, it is amazing just how much we do understand about the nature and origins of our universe as well as the incredible diversity of life that exists on our planet. Although there are mysteries that science may never answer, much of what we understand about our universe can be explained naturally and without the need for a god or creator. Isn’t Atheism just another religion? No. The Stanford Encyclopedia of Philosophy explains that the root issue of defining religion as related to religious belief. They therefore define a religion as a belief “appropriately connected with characteristically religious attitudes on the part of the believer, such attitudes as worship, love, commitment, awe, and the like.” While atheists certainly do love, are committed to others and may have feelings of awe, they do not worship or express these feelings in the context of their atheism as is required of a religion. Faith is a human concept often used to answer questions that cannot be settled by evidence alone. Faith can be interpreted as having a belief in something for which there is no sufficient evidence for. In fact, faith is belief in spite of, even perhaps because of, the lack of evidence. The concern about religious faith is the pretense of pretending to know something, or choosing to believe it, regardless of whether there is any direct evidence for it, - because it makes one feel better. This is the antithesis of seeking truth through scientific scrutiny and openness to results that may not necessarily provide an answer of ones liking or choosing. Although atheism does not imply any position on the existence of life after death, the majority of atheists do not believe in any type of afterlife. Of course, we all have concern about death, and that’s okay. It is one thing that every human being has in common. Although no one can prove what happens after we die, there are many reasons to be doubtful about the ‘soul’ and that it’s possible to go to a better place after death. Confronting the reality of dying, equips us with a maturity and strength to lead a more fulfilling, whole life and a reality-based way to grieve when the time comes. With this in mind, many atheists value the importance of making this life count and recognizing the beauty of our universe exactly the way it is in this moment in time. All mysticism aside, we can be certain that every atom in every one us will continue to exist even after we die. The atoms that make up our bodies will continue to remain, and will again become part of other life. Without god, what is the meaning of life? Some have argued that without god or eternal consequences, life is devoid of meaning. It has also been argued that if one has eternal reward or punishment, life is essentially meaningless because it occupies an infinitely short amount of time with little consequences for actions. For many atheists, life gains far more meaning by virtue of it being finite. We only have one chance to love our family and friends while making a positive impact on the world. We only have one chance to make our lives matter. Can you be good and moral without god? Just like some individuals within religious groups, there are some atheists who may act immorally, but most live honest, loving, fulfilling moral lives. Atheists don’t rely on threats of eternal punishment to be good people. It’s likely that most religious believers have the same motivation as atheists for being good to their fellow individuals. We do not get our morality from religion, if a person doesn’t already understand that cruelty is wrong, they likely won’t get it by belief in god. We decide what is good by recourse to moral intuitions that are (at some level) hard-wired in us and that have been refined by thousands of years of thinking about the causes and possibilities of human happiness. Whatever is good in scripture — like the golden rule — can be valued for its ethical wisdom without our believing that it was handed down to us by the creator of the universe. What about the great atheist dictatorships of the 20th century? Hitler, Stalin, Mao, Pol Pot? Some have argued that the atrocities of the 20th century committed by Nazi Germany and Communist dictatorships in the Soviet Union, Cambodia and China were the result of atheism. While a critical look at each of these dictatorships may cast doubt on claims that they were based in some way on atheism, it is more important to recognize a greater commonality running through each of them. Hitler’s Germany, Stalin’s Russia, Mao’s China and Pol Pot’s Cambodia all made free inquiry and questioning of authority a primary enemy of the state. They were each characterized by unquestioning dogmatic loyalty to the ideology of the state and the persona of the leader. What led to the massacres of the 20th century was dogmatism and the suppression of freedom of conscience, not atheism. Is Atheism connected to science? Although it is possible to be a scientist and still have faith in god — as some scientists believe — there is no question that an engagement with scientific thinking tends to erode, rather than support, religious faith. Taking the U.S. population as an example: Most polls show that about 90% of the general public believes in a personal god; yet 93% of the members of the National Academy of Sciences do not. 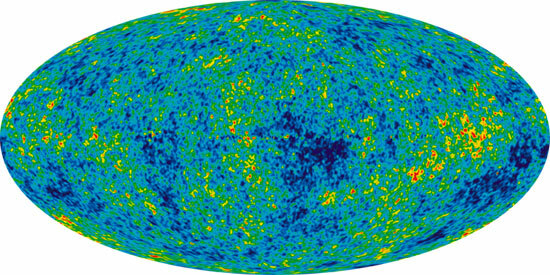 What is the relationship between atheism and the Theory of Evolution and the Big Bang Theory? The Theory of Evolution and the Big Bang Theory are both extremely well tested models that describe the diversification of life on Earth and the history of the universe, respectively. Consequently, many atheists have an interest in one or both theories as describing the natural world. There is no other relationship between atheism and either scientific theory. What is the relationship between atheism and skepticism? Are all atheists skeptics? Are all skeptics atheists? Atheism and skepticism are often mistaken for one another. 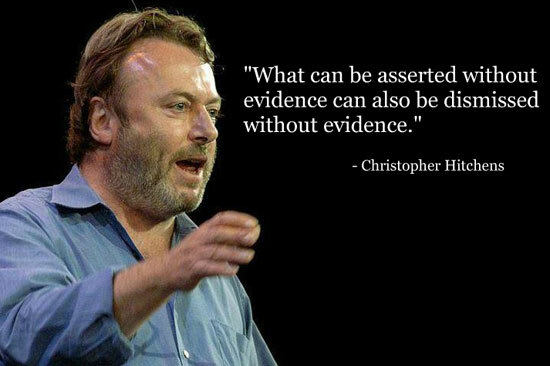 Skepticism is a philosophical position that, in a broad sense, holds that all claims need to be well supported by evidence in order to be believed. Many individuals consider themselves atheists because of their skepticism, but not all atheists arrived at their atheism through philosophical skepticism. Similarly, not all skeptics arrive at atheism through their philosophical skepticism. Atheism is only a description of people who lack belief in god, and does not denote an agreement with skeptical philosophies. Because of the overlap between skeptics, skeptical philosophies, lack of belief in god and people who lack belief in god, skeptical organizations often associate themselves with atheism, and atheist organizations often actively promote skeptical values. Do atheists believe in ghosts? UFOs? Angels? Psychics? etc? Atheism only describes one’s lack of belief in god, and consequently there are atheists with beliefs in the supernatural apart from deities. Most atheists, however, do not believe in any supernatural forces. Why do atheists care what religious people believe? Atheists don’t strictly care what religious people believe. Rather, atheists care how the beliefs of religious people affect the society in which we live. Religious belief can cause individuals to not have freedom of conscience or expression in fear of retribution from their community, prevents people from having access to knowledge or resources necessary to manage pregnancy or protect themselves from sexually transmitted diseases, and prevents loving committed couples from being able to marry. But isn’t America a Christian nation? Despite attempts by historical revisionists to recast the United States as a Christian nation, history does not support this claim. While many of the founding fathers were religious men, the majority of the men we think of as key in establishing this nation, including Thomas Jefferson, George Washington, James Madison, John Adams and Benjamin Franklin were deists, or people who believed in a deity that has no interest in human affairs. Thomas Jefferson, for instance, even edited the new testament to remove references to the supernatural. While interesting, the personal beliefs of the founding fathers are largely unimportant in trying to determine whether the United States is a Christian nation. Of far more importance is the content of the constitution. The United States Constitution makes no mention of Christianity or Jesus. This was not unintentional. Not only do contemporary accounts of the Constitutional Convention mention that references to god were specifically and overwhelmingly voted out of the Constitution, but the objections of delegates like Luther Martin, who argued “that in a Christian country it would be at least decent to hold out some distinction between the professors of Christianity and downright infidelity or paganism”, provide further evidence that the framers of the Constitution specifically objected to the notion that the United States would be a Christian nation. If we hold to Luther Martin’s premises, the United States can not be a Christian country as the government holds no distinction between Christians and non-Christians. Perhaps, however, the most important document to this conversation comes not from the libraries of the Founding Fathers or from the Constitutional Convention, but instead from the little known Treaty of Peace and Friendship between the United States of America and the Bey and Subjects of Tripoli of Barbary, commonly referred to as the Treaty of Tripoli. The Treaty was ratified unanimously by the Senate and signed by President John Adams in 1797. Article 11 of the Treaty begins “As the government of the United States of America is not in any sense founded on the Christian Religion…”. Clearly, neither the early Senators nor President Adams believed the United States to be a Christian nation. So maybe America isn’t a Christian nation, but shouldn’t the majority still get to decide what role religion will have in society? Although the United States is a democracy, it is also a Republic with protections for minority groups from oppression by the majority. These protections began, in part, with the Bill of Rights and have since by expanded by constitutional amendments and acts of congress. What this means is that while the majority of Americans may be of one religious denomination, protections exist to keep that religion from impacting the rights of individuals who have alternative beliefs or no beliefs at all. Chief among these protections is the separation of church and state, provided by the first amendment. But the phrase “Separation of Church and State” doesn’t appear in the Constitution, doesn’t that mean religion can play a part in government? 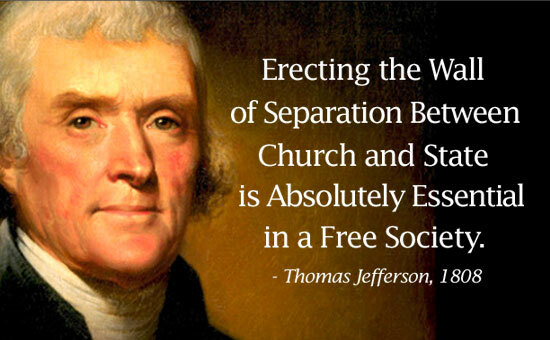 The phrase “separation of church and state” originates from a letter written by Thomas Jefferson to the Danbury baptists. In the letter, Jefferson writes that “the whole American people [...] declared that their legislature should ‘make no law respecting an establishment of religion, or prohibiting the free exercise thereof,’ thus building a wall of separation between Church & State.” Separation of church and state is thus a phrase coined by Jefferson referring to the protections of the first amendment. 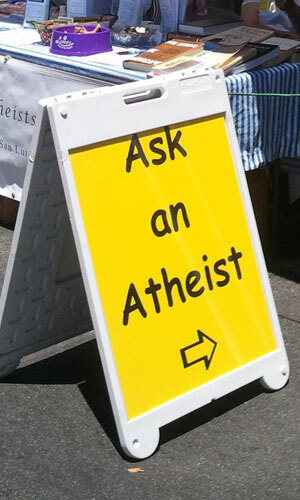 * Many thanks to AHA (Alliance of Happy Atheists) San Luis Obispo for contributions to this Q & A.